Though I'm not nearly a raw foodist, I do incorporate a lot of raw foods naturally into my diet (smoothies, salads, dressings, snacks, etc). I also enjoy trying out new raw food products. For instance, this raw granola from Kaia Foods. I picked up a bag recently from VeganEssentials, and liked it so much I then picked up another two bags with my next order. I've tried the Raisin Cinnamon flavor and also the Date & Spice variety, and both are delicious. I particularly like that there is much of the granola in bigger chunks, which makes it perfect for munching on-the-go. I've yet to have it with a non-dairy milk, simply because I've enjoyed nibbling on it dry in clusters. At this point, however, I'm left with loose granola in the bottom of the bags so it's soon time to try it with a non-dairy milk! Another thing I like about this Kaia granola is that it doesn't just use raw nuts and seeds as the base ingredients (as with many raw products). While it does include pumpkin seeds, sunflower seeds and a scattering of walnuts, its primary ingredient is buckwheat. Buckwheat is a grain that I rarely use in my own daily cooking, but want to consume for nutritional diversity. Now, I can enjoy it in a delicious and convenient way! One note about the Date and Spice variety. The dates are left in substantially large pieces with the clusters, and that makes for a lot of chewing of larger portions of dates. But, the flavors are beautiful, and the granola is not overly sweet (unlike many commercial and vegan granola). 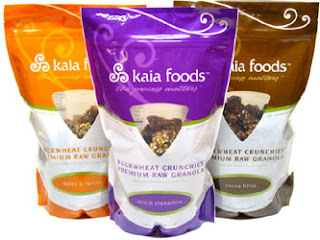 While it might be slightly more expensive than other granola products, I don't think it's unreasonably priced - especially considering this Kaia Foods granola is raw-processed and made with organic ingredients. I've yet to try the Cocoa Bliss flavor... but, I have it on my list for my next VE order! What a neat product! I will have to look for that. I love granola...especially making my own! I am going to get this next time I go to the natural foods store. I love when people review products because sometimes I get so lost when I'm shopping. Thanks for sharing! Looks good! I'll have to order some when I place my next VE order. Haven't seen this before. I'll have to look for it! I saw those at the health food store but didn't know if it was worth the money. I've been making my own buckwheat cereal and I love it! Can't wait to try these out! Thanks! Glad to hear you like this granola; I was looking at it a while ago. Just for accuracy, buckwheat is NOT a grain. It's a fruit. I'm going to keep my eyes open for this granola. Sounds divine! As for the wellness show...waaaaaa! It's in Vancouver. You seriously have to come east Dreena. Wow. I love granola but have a hard time eating it because of the butter and the fact that to bake it you are essentially getting rid of all the health benefits of the oats. This product is really exciting and I have never heard of it at all. Thanks so much for profiling it. mmm that looks delicious, i definitely want to try it out! ralph Lauren polo shirts , Lacoste Polo Shirts, Burberry Polo Shirts.wholesale Lacoste polo shirts and polo ralph laurenwith great price. clothingol.com offers lot of 10 lacoste polo shirts and lot of 20 cheap polo shirts. clothingol.com offers classic fit polo shirts. polo clothing All our shirts made in original factory. I like your blog . They are really great. Ermunterung ++ .please pay a return visit to my blog .thank you. Thank you for sharing such a nice article. Once upon a time, there was a mouse father.He wanted to marry his daughter to the greatest person in the world.But, who was the greatest person in the world?Oh! cheap nike shoesThe sun! He must be the greatest person in the world.The mouse father went to talk to the sun."Hello! Mr. Sun. I know you are the greatest person in the world.Would you marry my daughter?""What? I'm not the greatest person in the world. The greatest person is the cloud.If he comes out, I’ll be covered." The mouse father was very happy. He finally knew mouse was the greatest person in the world. He would marry his daughter to the handsome mouse next door.